This past weekend, the world celebrated the end of the First World War. Here's my microscopic contribution to that celebration: a tribute to those who agreed with St. Martin of Tours (feast day, November 11!) who said "I am a soldier of Christ; it is not lawful for me to fight." In our conversation classes in Russia, we showed the film Einstein and Eddington several times over the years. At the center of the film is the collaboration between Albert Einstein and British Quaker astrophysicist and mathematician Arthur Eddington. Eddington's pacifism comes up several times in the film. With the arrival of compulsory military service, Eddington wanted to apply for exemption as an objector, but, instead, Cambridge University certified that he was performing work of national importance. My objection to war is based on religious grounds. I cannot believe that God is calling me to go out to slaughter men, many of whom are animated by the same motives of patriotism and supposed religious duty that have sent my countrymen into the field. To assert that it is our religious duty to cast off the moral progress of centuries and take part in the passions and barbarity of war is to contradict my whole conception of what the Christian religion means. Even if the abstention of conscientious objectors were to make the difference between victory and defeat, we cannot truly benefit the nation by willful disobedience to the divine will. Conscientious objectors often faced fierce criticism from their fellow-citizens, whose own friends and relatives were facing bullets, mustard gas, and all the other hazards of combat. 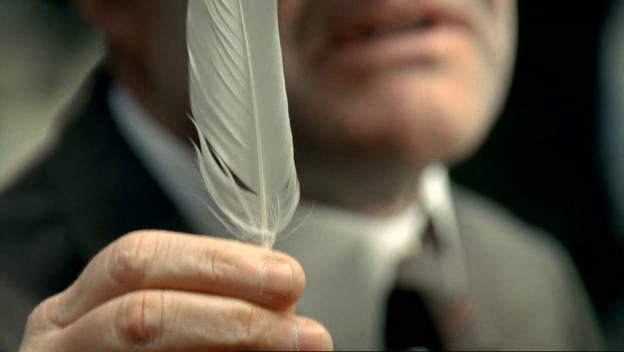 In one scene in Einstein and Eddington, the astronomer is accosted with that notorious symbol of shame, the white feather. Although this specific scene may be fictional, these confrontations happened often. In Eddington's case, thanks to strong support from fellow academics who realized that his work on Einstein's theory of relativity was of paramount importance, he was allowed an exemption in order to plan for the 1919 eclipse experiment which appeared to vindicate Einstein's revolutionary ideas. Eventually, the authorities challenged his status, and it's possible that the only reason he wasn't eventually court-martialed was the end of the war. Some conscientious objectors served in combat situations as noncombatant medics, facing the same hazards as soldiers. Among those Friends who served in this way, I'm choosing Corder Catchpool as a source of inspiration for this post today -- not because he was the only Friend to make that decision, but because he wrote so vividly and persuasively about the agonizing choices he faced. 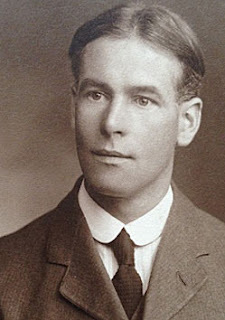 In 1918, Catchpool's sister and brother-in-law published his wartime letters, On Two Fronts, in which he describes his experiences on and near the front lines with the Friends Ambulance Unit. The first half of the book describes those experiences -- at times with passion, at times with humor ... and sometimes with ghastly precision. Things changed when compulsory military service began in 1916, and the military chain of command tightened around the small bands of pacifists who operated the Friends Ambulance Unit. Catchpool could not reconcile himself to this development, and resigned his position. He applied for an absolute exemption from service while rejecting any form of alternative service that involved military oversight, and when his application was refused, he began four rounds of courts-martial and imprisonment at hard labor. Indeed, he was still in prison when the first edition of On Two Fronts was published. The correspondence from this period, after his resignation from the ambulance service, constitutes the second half of the book. Detail from announcement of the Military Service Act (1916). Source. [1916, addressed to the local and appeal tribunals] Conscience does not primarily object and refuse, but commands. It commands loyalty to the voice of God in the heart. I think this is the same thing, whether it is called religion or morality. I am not chiefly concerned to secure exemption from military service, but to bear witness to the Truth as it is revealed to me: knowing that I do this whether I obtain exemption or not, so long as I remain true to principle. I have little desire for my own safety and comfort, when hundreds of thousands of my fellow-men of all nations are laying down their lives. Most strong young men to whom the ideal makes an appeal are possessed by a passion for adventure and sacrifice in a noble cause. I am no exception: I understand and honour those, my comrades, who have enlisted in the army to fight, as the believe for the right. The greatest sacrifice I have ever made is to withhold from sharing with them their sublime self-surrender. But I too am enlisted, not merely for three years or the duration of the war, under a Captain who also calls for adventure and sacrifice in His name: whose commands to me are unmistakable, not only to act towards enemies in a very different spirit, and to overcome them redemptively with very different weapons from those which are being used on the battlefields to-day; but also to proclaim His commands and win recruits to His cause. I want to do more than admire Catchpool and his comrades. I want to continue proclaiming those same commands and win recruits to the same cause. I want to be marked as that same "special brand of patriot." If you served on the staff or committees of Friends World Committee for Consultation around the same time I did, you will remember a dear Friend, Heather Moir (1928-2009), who served in many roles, including clerk of FWCC Section of the Americas. Heather was Corder Catchpool's niece. The film Einstein and Eddington can be viewed on this page (at least as of this evening). The same page has a brief biography of Catchpool. The Journal of the Friends Historical Society has a fascinating article on Catchpool and his involvements with Germany. When did World War I finally legally end? A Remembrance Day sermon: scandalous or self-evident? How Dove's Nest trains churches to keep children safe. Micah Bales: Elijah, the widow's mite, and a way of hope. A mini-documentary on Johnny Cash's concert at Folsom Prison.